The team at KnowNow Cities have over five decades of combined cross discipline experience. This has shaped the approach and thinking when it comes to smart cities. In terms of pure smart cities then the team have over two decades hands on experience in delivering and collaborating on smart city projects in the UK and SE Asia. KnowNow Cities will through its engagements provide cities with a technology design and roadmap that will match these themes. To know more about these 5 themes read this blog. These projects give KnowNow Cities the practical insight and hands on experience. Therefore going from designing a smart city to realising that smart city as an actual live, viable technology project. The other reason why KnowNow are ahead of the pack is our approach to smart city design. This is because of our adoption of an Enterprise Architecture method, backed up by the use of the Corso Agile EA tool. This approach means KnowNow Cities can capture from the business outcomes perspective what is important. This then realises the critical technology components to be delivered. This approach minimises risk and maximises gain. Whereas other approaches typically focus on the tech to be deployed and not worry about who will use it for what purpose. These types of project are not sustainable, are often short lived and become expensive mistakes. Due to the approach taken it is also possible to put a numerical value against the component to be delivered, as well as highlighting its interdependencies. This will allow stakeholders to prioritise the outcomes they want to see delivered in a joined up fashion. The approach is underpinned by standards. These standards when applied to a smart city project increase the chances of a successful project. Standards de-risk, improve internal communications, provide certainty and improve quality. An important factor is the multi-discipline skills sets in the KnowNow Cities team. Chris is both a social scientist and a Chartered Engineer. Prior to KnowNow Chris was the Smart Cities Technical Leader, and before this he was the Transport Technical Lead for IBM UK. Smart Cities has been part of Chris’ professional life for the last decade. Longer than most practitioners and experts! Allied to many years delivering complex IT systems for a variety of clients in the private and public sectors. Which has provided Chris with a deep understanding of technology infrastructure, its management, its need to meet an ROI as well as an NFR! The associates KnowNow Cities uses are all experienced IT practitioners and Enterprise Architects. 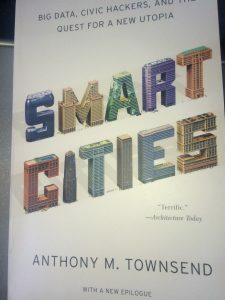 At KnowNow Cities the philosophy of the smart city has been shaped by the experiences of delivering complex IT systems for sensitive clients for many years. Smart Cities are no different! Additionally it is shaped by the underlying philosophy that tries to articulate why a smart city works. As well as why it is better than a non-smart city. It is the Outcomes that are important. The Outcomes that have citizen engagement will prove to be the most sustainable too. What can KnowNow Cities Offer that is different? The KnowNow Cities customer experience! This is based on a set of sound principles: Knowledge, Philosophy and Approach. If you would like to know more about working with KnowNow Cities then use the form below.